Potassium (K), along with nitrogen and phosphorus, is one of the three essential plant macronutrients, and is taken up by crops from soils in relatively large amounts. Potassium increases yields and improves the quality of agricultural produce. Potassium also enhances the ability of plants to resist diseases, insect attacks, cold and drought stresses and other adverse conditions. It helps in the development of a strong and healthy root system and increases the efficiency of the uptake and use of nitrogen and other nutrients. In addition, potassium has an important role in livestock nutrition. The importance of potassium stems from its multiple roles in the plant: it is involved in the activation of more than sixty enzymatic systems in the plant cell, and in the synthesis of proteins, vitamins, starch and cellulose which ensure normal plant metabolism, plant growth and formation of strong tissues. Potassium helps photosynthesis, the process through which the sugars and energy that the plant needs for its development are formed and converted. Potassium also controls the opening and closing of the leaf stomata, which regulate the water status in the plant. It plays an essential part in the formation of starch and in the production and translocation of sugars. Potassium is, therefore, of special value to carbohydrate-rich crops such as sugarcane, potato and sugar beet. The production of starch and sugar in legumes boosted by potassium benefits the symbiotic bacteria living on the roots and and thus improves the fixation of nitrogen. 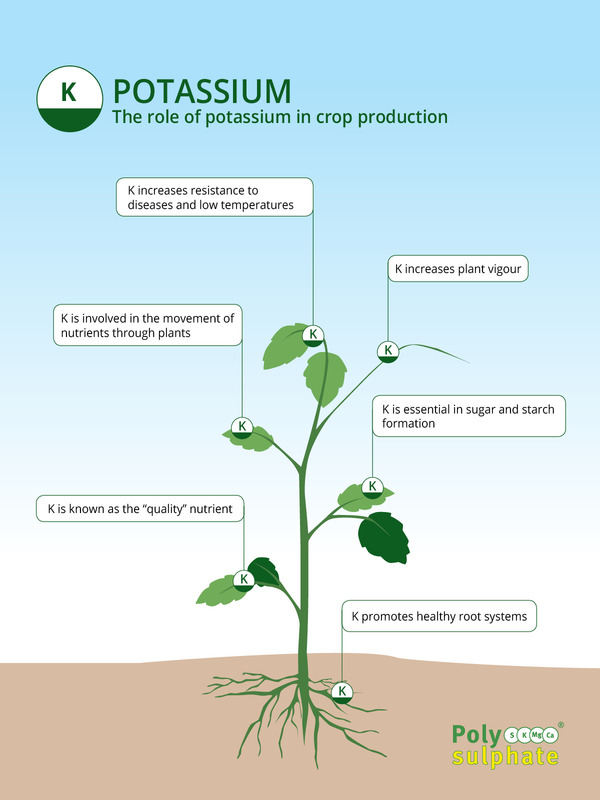 Potassium not only increases yields but also enhances crop quality. It improves the nutritive value of grains, tubers and fruits by increasing the contents of protein and oil in seeds, of starch in tubers and seeds, and of vitamin C and sugar in fruits. With an adequate supply of potassium, cereals produce plump grains and strong stalks. Potassium also improves the flavor and color of fruits and increases the size of tubers and fruits. In addition, it increases the resistance to various injuries during storage and transportation, thus extending shelf life. Plants deficient in potassium 'lodge' or bend over at ground level making them difficult to harvest. 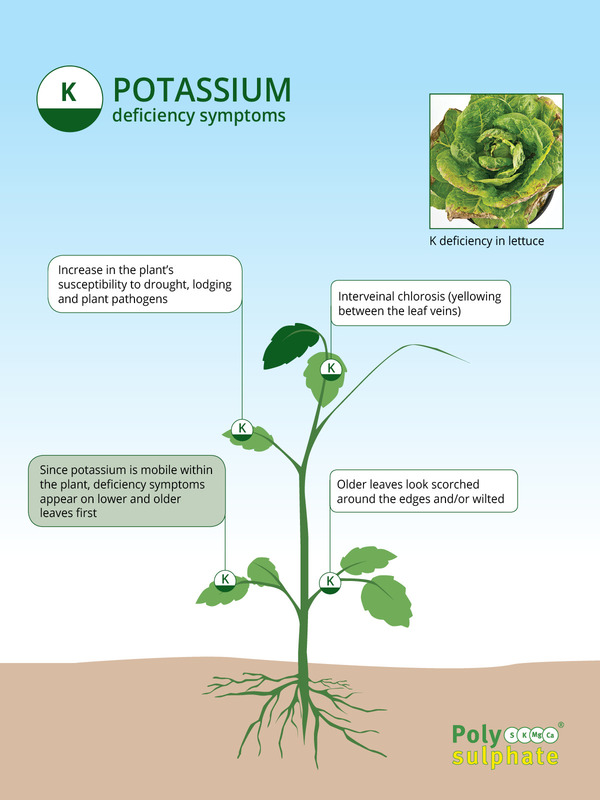 Potassium deficiency makes a plant susceptible to disease. The edges of older leaves appear to have burned edges (scorching) and, since potassium is mobile in the plant, the bottom and older leaves show deficiency symptoms first.